I’m starting a Cooking A-Z project on my blog to challenge me and spark up my baking experience. I was inspired by Sweets, Eats, and Crafts to do this, and I highly recommend you checking out her blog! It’s quite amazing. Hopefully my posts will inspire you to start a Cooking A-Z of your own. Okay, so I have a confession. I actually burned my hand pretty badly while making my first batch. It led to a pretty not-so-delightful blister. Oops. But hey, everybody’s gotta make some mistakes to get where they are.. right? Right……? Sigh. Hopefully someones agrees with me there. Anywho, here’s the recipe. 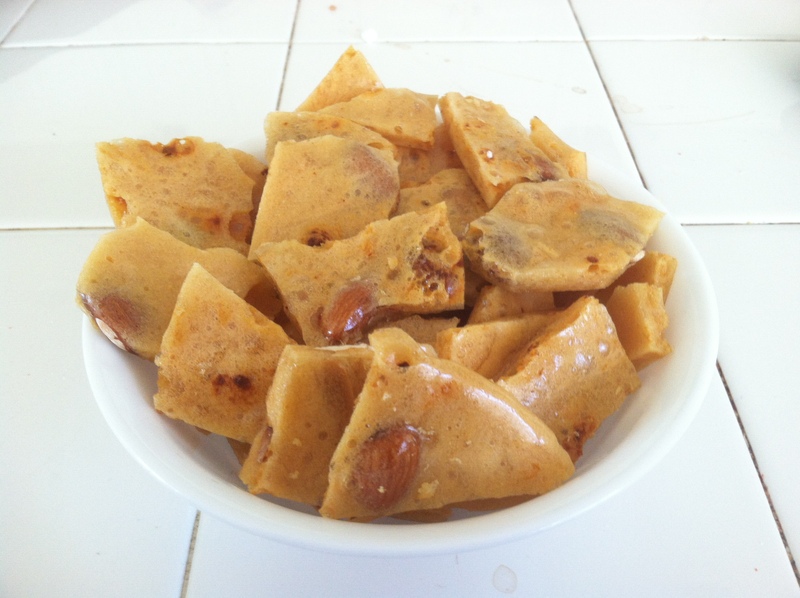 It’s originally a recipe for peanut brittle, but I used up all the peanuts I had when I made my burned batch so I had to substitute for almonds. By the way, you don’t need a functional oven to make this recipe because this is made in the microwave! PLEASE, PLEASE be extremely careful when making the brittle. If using a slightly smaller bowl, the mixture will overflow when the baking soda is added and you may burn yourself. Grease a baking sheet, and set aside. In a glass bowl, combine peanuts, sugar, corn syrup, and salt. Cook in microwave for 6 to 7 minutes on High (700 W); mixture should be bubbly and peanuts browned. Stir in butter and vanilla; cook 2 to 3 minutes longer. Quickly stir in baking soda, just until mixture is foamy. Pour immediately onto greased baking sheet. Let cool 15 minutes, or until set. Break into pieces, and store in an airtight container.